When Karly asked if I would guest blog on the fabulous Design Crisis I was flattered beyond belief! It's not every day a little kid like me gets to play to with the big girls! And then, after having already committed myself, the reality set in; what the hell would I write about?....design expert I am not. Not even close. Having never attended any type of design-school, I'm learning as I go and making mistakes along the way. My classroom is Life -- my instructors are *you*, the design mags, and my go-to for everything in between: Google. I have Googled my little business, Pillow Mint, into existence. I've never gone to Market (though hopefully make it to New York in February!) and did all my preliminary sourcing for the store on the internet. I have no formal education in either business or design, but I do know what I like and I know where my passions lie. When I was starting the business I would tell people I wanted to "spread the joy." I wanted people to be as happy in their bed as I am in mine. There is an instant sense of belonging when someone else gets my obsession. When a client comes into the shop and gushes and goos over the lines I carry and we talk "bed", I get happy; ecstatic really. I have learned, too that what one puts on their bed is so subjective. 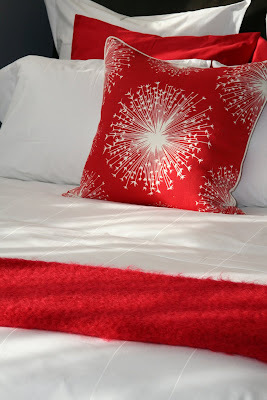 Some people can't stand sateen sheets, others can't stand getting hot at night, some people freeze and need warmth! and then there is my husband, who likes weight, and layers. It's all so very personal. 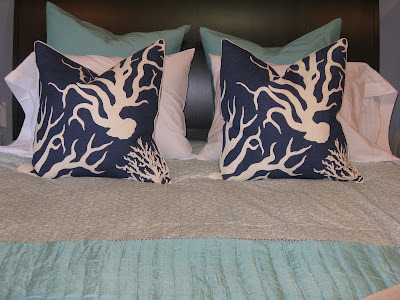 Bedding is really an intimate subject - get to know someone's bedding desires and you know a lot about them!! Color, pattern, lots of pillows, cotton or linen, down or synthetic, silk or wool.....you must find your bliss and go there. 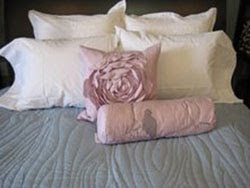 The most important thing to understand about thread count is higher numbers do not mean better quality. In fact, there is an argument to be made that a lower thread count may be a more comfortable sheet. First you have to understand thread count. The right way to calculate this involves adding up all of the vertical and horizontal threads (warp and weft) in a square inch of fabric. There are only so many threads you can realistically fit into a square inch and generally speaking, anything over 300 is more perceived value than real value. Many companies exaggerate the number by counting the number of ply's in a yarn, so a 300 count sheet using a 2 ply yarn may be promoted as a 600 count. The key element most people don't think about when purchasing sheets is how they sleep. Everyone perspires while sleeping, so ideally you would want a sheet that is breathable and absorbent, as well as being soft and comfortable. Higher thread counts mean a tighter weave and consequently a sheet that does not breathe as well. Selecting a good quality sheet involves looking for a brand that uses 100% cotton. Cotton is still one of the best fabrics when it comes to comfort, durability and care. In August 2005, Consumer Reports issued a report about high thread count sheets from nationally known brands and concluded: "Two hundred is typical and perfectly fine; 400 my provide a finer, softer sheet. Above 400, the only difference is likely to be price. I could go on and on for days about bedding and my love for the cozy, but I think that's enough from me! Sleep well ~ you deserve it!